Survey is a means to view and examine the condition of an object. 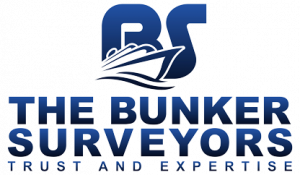 Bunker Survey is an examination of the ship's fuel to ascertain its total on board quantity. it can be ROB quantity, ROB is Remaining On Board of fuel oils like MGO (marine gas oil) or MFO (Marine Fuel Oil) or LSFO (low sulphur fuel oil) or HSFO (high sulfur fuel oil) or LSMDO (low sulfur marine diesel oil). Bunker Survey is carried out mostly by visual observation, facts finding, about the general data and idea, by measurements, technicals matters, etc. and, if needed, provide recommendation. Bunker survey is carried out to measure and ascertain the quantity of Bunker on board at the specific time. This survey is produced the report that states the amount of bunker, usually Fuel Oil (FO) and Diesel Oil (DO), and sometimes Lubricating Oil (LO) is included. Bunker Surveyor is the person who hold a valid bunker surveyor license issued by the implementing authority. Surveyor is the person who conduct the survey, for doing the job, the person is expected to be independent and backed up by sufficient professionalism.